Long Wind Farmis located in Thetford, VT.
Dave Chapman and his team of oxen started Long Wind Farm in 1984 with a small piece of land on the New Hampshire-Vermont border. Over the last thirty years, he and his wife, Laura, have perfected the process of producing soil-grown, organic greenhouse tomatoes that not only look good, but taste good, too. 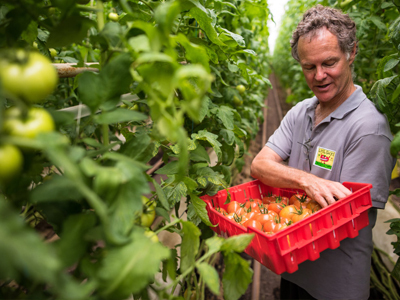 The Boston Organics Community has been enjoying Long Wind Farm’s tomatoes since 2009.